Three hundred pounds of pandemonium at the end of a fly line will have your heart pounding out of your chest. I lift the flamboyant pink-and-white tube fly into a backcast and drop it in the wake slightly behind them. Both marlin attack. The larger one, more than 300 pounds, gets there first and engulfs the fly from above, no hook set required. The fish races straight away from the transom, taking 300 yards of backing faster than you can say 300 yards of backing. A towering jump is followed by a 90-degree turn and three more greyhounding leaps, the fly line ripping audibly through the water behind it. On the third jump, the marlin kicks its massive tail and the line catches a wave, adding just enough pressure to part the 20-pound leader. The whole scenario took 15 seconds. The display of power, acceleration and raw athleticism left me standing, mouth agape, heart pumping, amazed. I had just lost the seventh blue marlin to eat my fly in two days. I was batting zero in the biggest fishing game of my life, but I wasn’t done. I was determined to bring one to the boat. Most important, Jake Jordan, the best teacher on the planet, was looking over my shoulder, coaching me. Catching any billfish on a fly is a feat. 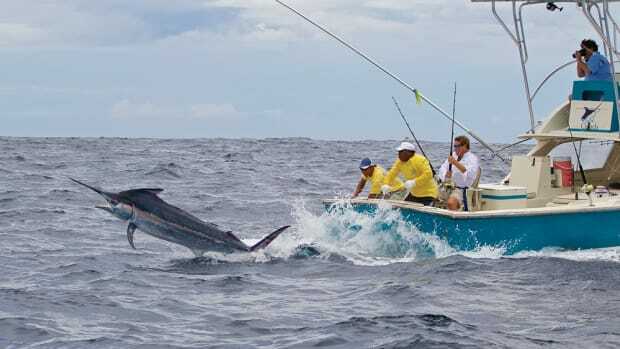 Catching a blue marlin on 20-pound IGFA-legal fly tackle is a consumate challenge. It’s a dream so few have accomplished that it is statistically insignificant when weighed against the universe of anglers. But during my time aboard Dragin Fly, I was under the tutelage of Jordan, who has made catching billfish with a fly rod a reality for hundreds of anglers. 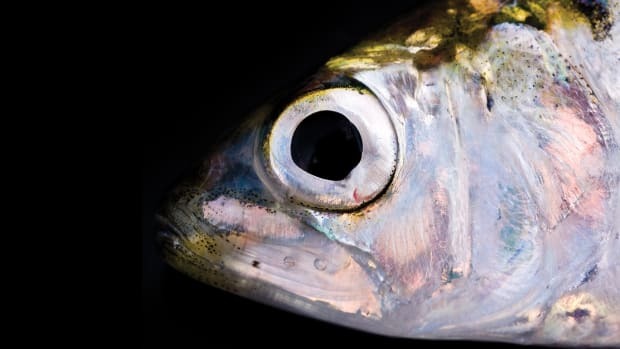 He has had a dramatic impact on the development of the tackle, rigging, teasing, fighting and even the boat-handling techniques that have made possible what was once thought nearly impossible. Jordan has instructed and guided most of the top big-game fly fishermen in the world. He mentored Nick Smith, who has caught more billfish on fly than anyone. Martin Arostegui, the first person to achieve the International Game Fish Association Royal Billfish Slam on fly, studies and fishes with him; Jordan was at Arostegui’s side when he caught the Pacific blue marlin that helped complete his quest. Jake Jordan might not be a household name, but tens of thousands of fly fishermen follow his exploits through his emailed fishing reports, and a lucky few get to fish with him. 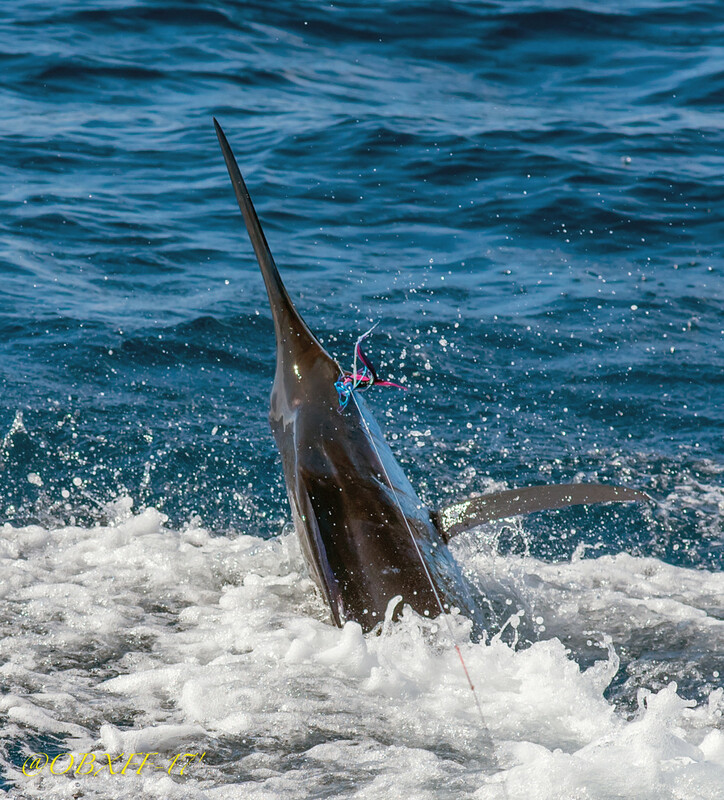 How difficult is it to catch and release a blue marlin on fly tackle? In an attempt to explain the degree of difficulty, Jordan uses a home-brewed rating system that compares the power and speed of various big-game species — and he has caught them all. Tarpon, a fish he has been pursuing for nearly 60 years as an angler and top Florida Keys guide, form the baseline for comparison. Obviously any comparison between big-game species is subjective, but Jordan’s explanation provides a basis for understanding just what an angler is up against when trying to catch blue marlin on the fly. And 50 years of on-water experience back up his observations. 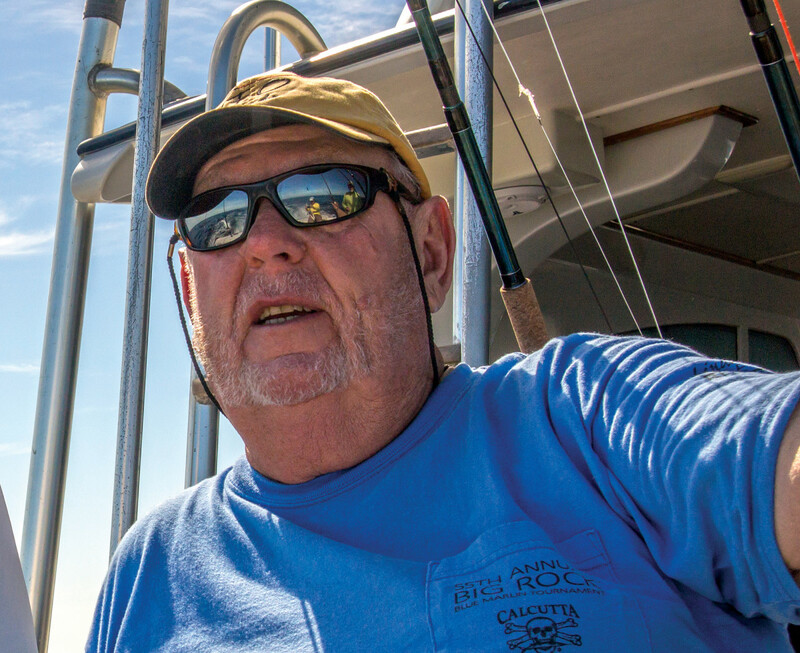 He caught his first billfish on a fly more than 40 years ago, at a time when others would not have considered it remotely feasible. During his long career as a guide, instructor, innovator, tackle designer and fly-fishing trailblazer, he has done it all, many times over. 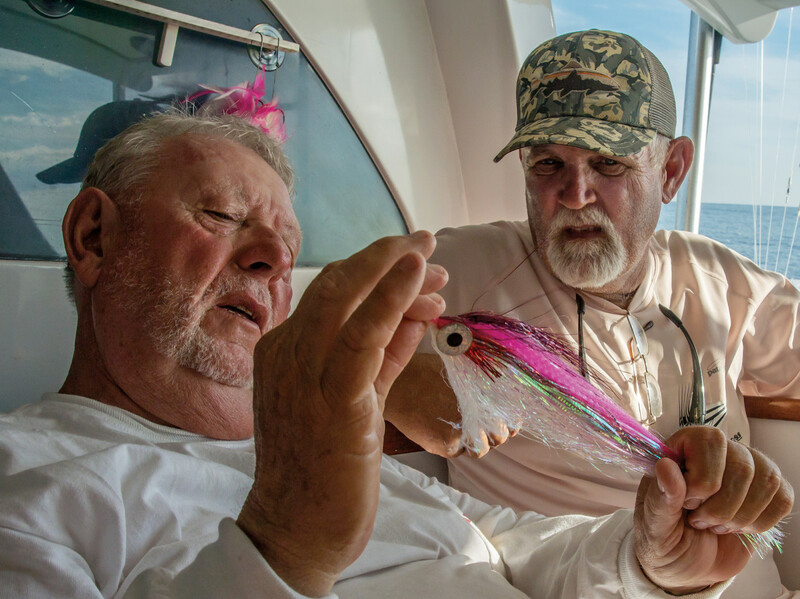 At 76, he is planning his next tarpon season in the Keys, and sailfish and blue marlin seasons in Central America. 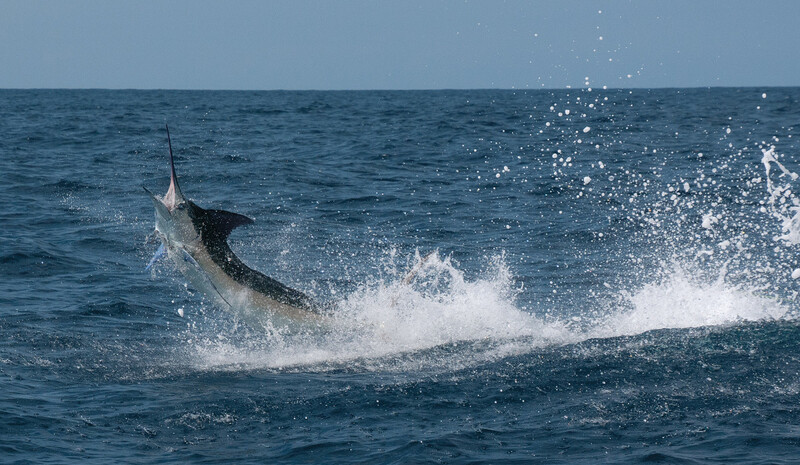 Nothing can prepare the uninitiated for what ensues when they hook a blue marlin on a fly. Jordan was born in Delaware County, Pennsylvania, in 1942. His father was a machinist for Westinghouse during World War II, running the largest milling machine in the world, which produced turbines to power aircraft carriers. Jordan spent summers with his mother and two sisters in Ocean City, New Jersey, 60 miles away. His earliest fishing exploits were catching northern kingfish, oyster crackers and sea robins, but when his father got time off, they’d chase flounder, weakfish, bluefish and occasional striped bass. They fished from the family’s 16-foot Old Town rowboat, powered by a 7.5-hp Johnson Seahorse outboard. After the war, his father purchased some “swampland” on New Jersey’s Bass River, built a house and started filling in the marsh, one station wagon load of sand at a time, with the goal of building a marina. He opened a small bait shop and ice house as Bass Harbor Marina grew to have 39 slips and marine services. The family acquired a 31-foot Johnson Brothers lapstrake boat powered by a Ford flathead engine, which was quickly swapped out for a 36-hp diesel from a tractor. Jordan enlisted in the Marines fresh out of high school and, after completing basic training at Parris Island in South Carolina, received a “temporary assignment” to what was then known as the U.S. Coast and Geodetic Survey. There, he was part of a team mapping the United States. The team used a geodimeter, a measuring device that shot a beam of light as far as 20 miles to establish a baseline for triangulating distances with precision. 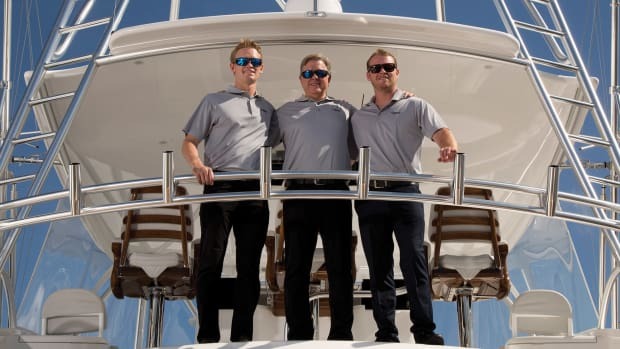 After Jordan mustered out of the service, he moved to Fort Lauderdale and got a job managing a marina. He also started his first company, which specialized in locating and restoring antique boats and yachts. Several examples of his work are still on permanent display at Mystic Seaport in Connecticut. Jake Jordan (left) and North Carolina guide Brian Horsley discuss the merits of fly patterns. From the first time he saw the Florida Keys, at age 9, Jordan knew it was where he wanted to live and fish. It was 1951 when his father took him on an adventure that traversed the East Coast from their New Jersey marina to Marathon, Florida, to deliver a customer’s Rybovich. After the trip, they spent two weeks fishing and exploring the island chain. “We managed to catch 31 species of fish using nothing more than clams for bait,” Jordan says with a smile. “I moved to the Keys in 1963, got a job at a tackle store and started charter fishing. I was the mate on my first six trips and captain from there on, running a 24-foot single-screw Pacemaker with a fighting chair, taking customers tarpon fishing. In 1977, Jordan opened World Class Angler, a fly-fishing specialty shop, in the lighthouse at Faro Blanco in Marathon. It quickly became home base for many of the best light-tackle guides in the middle Keys. 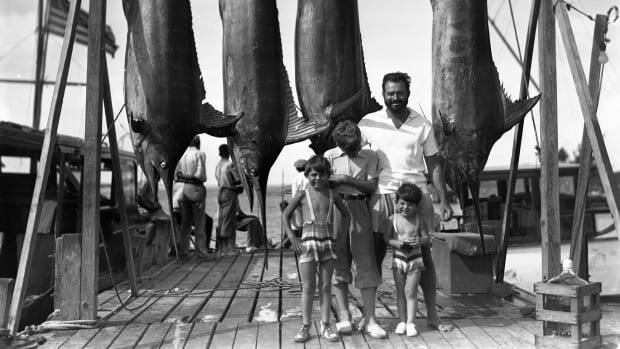 He had built a large clientele of fly fishermen who chartered with him to challenge the Keys’ big three: tarpon, bonefish and permit. He traveled the world fishing for marlin on conventional tackle. Back home, they chased sailfish on the reefs using light spinning gear. But after his introduction to fly-fishing for tarpon, Jordan became captivated with the idea of catching sailfish on his tarpon fly rod. 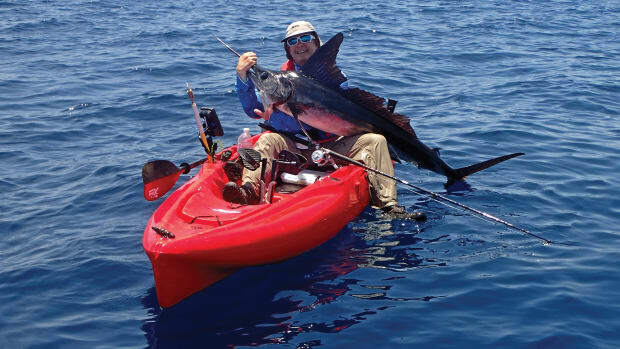 The upshot of his early efforts with sailfish is that Jordan developed a technique for luring and catching billfish on a fly more than 40 years ago. And that was just the beginning. Over time, fly-fishing for billfish became an all-consuming passion. 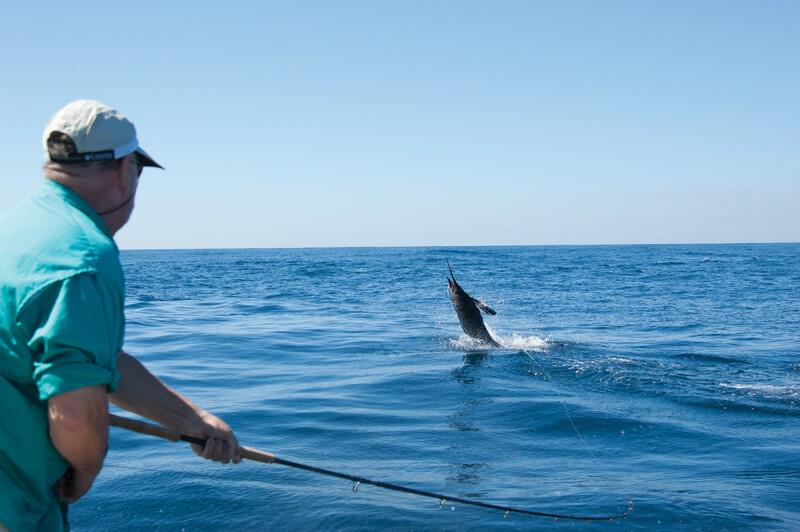 Jordan honed his technique and tested his tackle on thousands of Pacific sailfish. By the early 1980s, Jordan’s fly shop in Marathon was developing into one of the earliest sportfishing travel agencies, catering to an exclusive clientele. The business increased his access to the hottest billfish meccas at the time, but he had yet to attempt to catch a marlin on a fly. 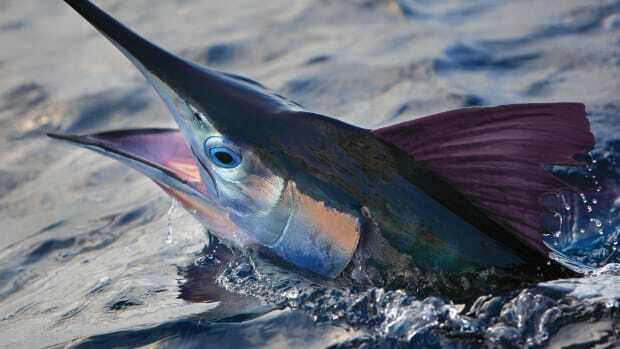 That would become reality a few years later, when he started using sinking fly lines around the bait balls off Isla Mujeres, Mexico, and caught several white marlin — another important step to the difficult, exacting challenge of tackling a blue. Around the same time, there was a prolific blue marlin fishery developing out of Key West on a spot called Woods Wall. Jake started working on bait-and-switch techniques there and discovered it was possible to get blues to take a fly. Jordan’s popularity with fly fishermen led him to develop a series of “schools” aimed at teaching the techniques required to catch and release gamefish. His first one, dubbed the Bonefish School, was run for many years out of Peace & Plenty Lodge on Great Exuma in the Bahamas. It brought together a couple dozen fly fishermen with a teaching staff of the world’s top guides, fly casters and fly tyers for a week of classes and fishing. It was so successful that he expanded the concept to bigger game. He established his first Billfish School with the help of Tim Choate, then owner of Fins and Feathers in Costa Rica and, later, Guatemala. Jordan worked with the lodge’s top captains and mates to establish the techniques to attract, tease, cast and fight billfish on fly tackle. It was very different from trolling conventional tackle and baits, but once the basics were in place, they would hone them to the point that the hookup ratio in the ensuing years soared. Jordan started bringing in small groups of clients to teach them how to fly-fish for the abundant Pacific sailfish found along the Central American coast. Each group would spend three days fishing with Jordan, along with two days of in-depth instruction. The sheer numbers of sailfish encountered offered every client the opportunity to catch multiple billfish on one trip. I fished with Jordan at his original Bonefish School in Exuma, the first Sailfish School in Costa Rica and, more recently, at Casa Vieja, Guatemala, where the school resides today. 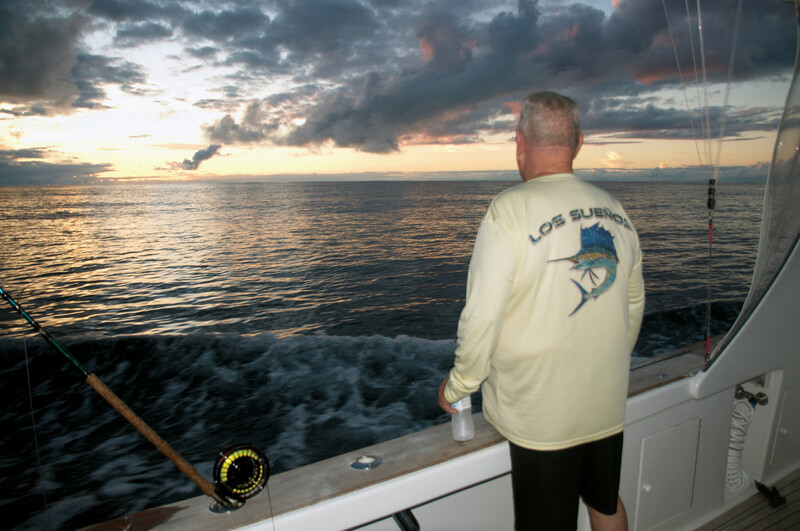 With that background, I was primed for our most recent adventure fishing the FADs (fish aggregating devices) off Costa Rica at his Blue Marlin School. 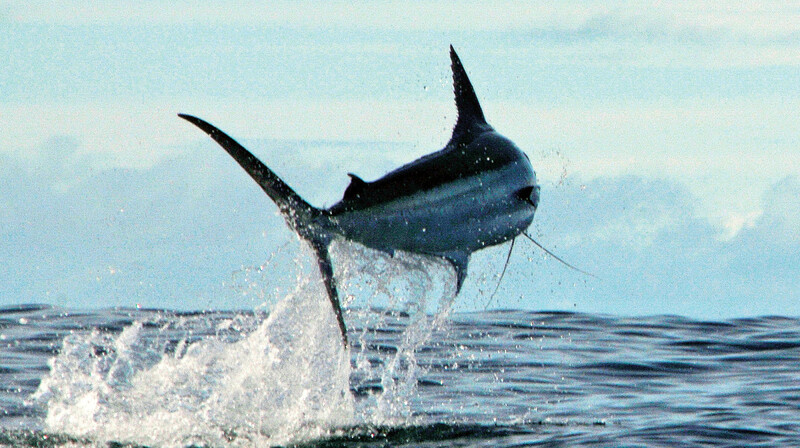 While Jordan was honing the techniques to tease, cast and hook billfish, advances in tackle were greatly improving the ability to fight them. Thin, gel-spun braid for backing made it possible to pack enough line onto fly reels to challenge bigger game while reducing the line’s drag in the water. 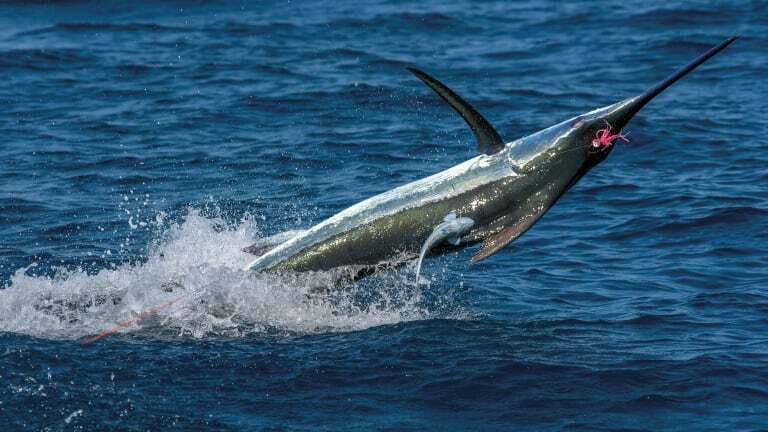 Dramatic improvements in drag systems gave the angler the ability to make the minute changes in pressure settings needed to move up from sails to marlin. Jordan, with world-renowned billfish captain Ron Hamlin, perfected fail-proof connections that bring together his system of backing, monofilament topshot, shooting head and leader that incorporates the class tippet and Mason hard monofilament bite leader. Each leader is assembled to conform to IGFA requirements. He uses TFO Bluewater SG Series rods, which he designed for the company, and Mako fly reels by Charlton for their smooth, repeatable drag systems that allow for marking presets so the angler knows exactly how much pressure is being applied. Catching a sail or marlin on the fly is a choreographed dance that requires a troop of talented people. Jordan developed many of the techniques in conjunction with top captains and mates. 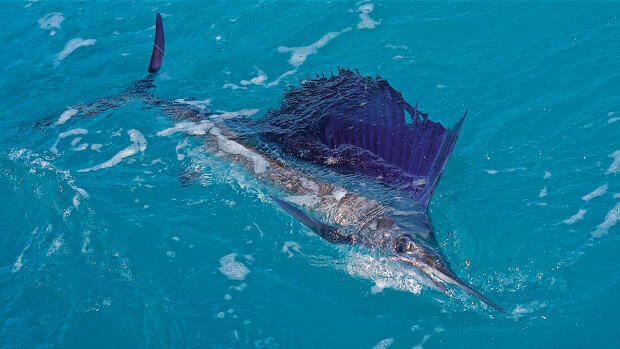 For them, catching sailfish and smaller marlin species has become commonplace. With Jordan aboard to teach the angler how to fit into the routine, results are assured for sailfish and lesser marlin species. The ratio of those billfish that tease to the boat, take the fly, and are fought and released is extremely high, but when you up the game to blue marlin all bets are off. The fish’s size, speed and power dramatically increase the variables that can cause the angler to lose the fish. Even taking that into consideration, every angler who has accompanied Jordan at his Blue Marlin Schools in Costa Rica during the past three years has caught and released at least one blue, and most have achieved multiple fish during their three-day sojourns. From Jordan’s home base at Los Sueños Resort and Marina, we boarded Dragin Fly on a Monday at midafternoon. The boat cruised slowly for a first-light arrival at a seamount 140 miles offshore. The submerged mountain rose from the sea floor thousands of feet below to approximately 1,000 feet at its crest. Deep-water currents striking the seamounts generate nutrient-rich upwellings and plankton blooms, an ideal environment. Two FADs had been deployed about a mile apart on opposite ends of the peak, each tethered to the bottom with massive concrete blocks and a series of 300-foot sections of cable with numerous floats. The final float is set at 90 feet, where streamers create a congregating point for schools of baitfish and small tuna, a billfish staple. We would fish this one seamount for three days, sleeping as the boat drifted on a sea anchor in darkness. During the first two days of trolling with just three teasers deployed, the boat raised 46 blue marlin that mates Berto and Roberto teased into the pattern. Twenty ate our flies, and we managed to catch and release four, a 20 percent conversion ratio, which is excellent, according to our host. After losing seven straight, I didn’t have to wait long for another shot. Marlin popped up fast and furious in the pattern. A hot fish of about 150 pounds charged the spread, and Berto and Roberto teased it to within 30 feet of the transom. Smith pulled the boat out of gear and yelled, “Cast!” I dropped the fly to the right and slightly behind the fish from my position in the port corner of the cockpit. The cast found its mark, the take was aggressive, the hook set was solid, and the first run was blistering. I had the drag set at just 1 pound so the fish couldn’t break the tippet. 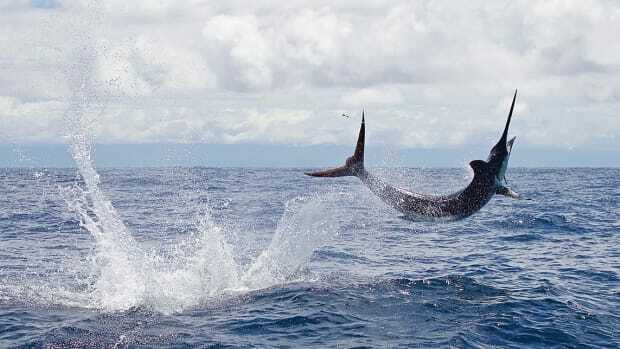 The sinking line trailing below and behind it kept the marlin on the surface for an extended display of acrobatics, which few fish can match. Then it went deep and held there, testing backing, fly line, leader — every connection strained. The weakest link was the slender 20-pound tippet. Jordan calmly coached me to increase the drag pressure as Smith worked the boat in an attempt to angle the fish back to the surface. 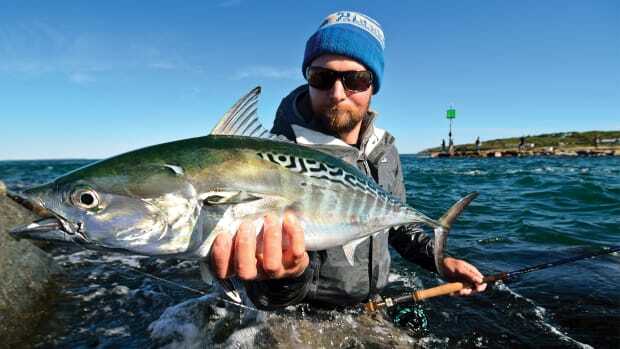 There is no frenetic backing down on these fish at crazy speeds, as with conventional tackle, because the reels offer no mechanical advantage. One turn of the handle is one revolution of the spool, and the angler can only pick up line so fast. You fight these fish with minimal aid from the boat. When the fish wouldn’t budge, Jordan instructed me to go to free-spool and let the weighted line sink below the fish a little. The minute pressure pulling down worked, and the fish made its move back to the surface. With the drag back to 3 pounds, I was ready to take advantage of the moment. The back-and-forth with bursts of speed and jumping went on for another 10 minutes before I was able to bring the fish close to the boat. A little more effort, and the last of the fly line was back on the reel, the leader inside the rod tip. Roberto grabbed the leader, brought the fish close, billed it and removed the fly. Mission accomplished. Later in the day, with the sun dipping toward the horizon, I got another shot at a much larger fish, which I caught and released. Both Jordan and the captain agreed that it was about 270 pounds, and it was even more acrobatic and belligerent than my first. But technique and persistence won out. I had done what very few anglers would ever attempt, and I’d accomplished it with my friend, the guru of big-game fly fishing, at my side.